The MakerBot Replicator Mini+ is a single extruder 3D printer with a 10.1 x 12.6 x 12.6 cm (L/W/H) build plate, allowing users to print PLA objects up to 98 cubic inches. The Replicator Mini+ prints at up to 100-micron layer resolution, allowing for high-quality, detailed prints. It comes with MakerBot Print, the company’s desktop print preparation software that includes Thingiverse Education integration, which makes searching for and printing pre-existing projects simple. MakerBot Print software accepts all CAD files for printing. Quality and Effectiveness: The MakerBot Replicator Mini+, which can print PLA without a heated print bed, is appropriate for the K–12 learning environment. MakerBot refers to the suite of software as a 3D ecosystem, which includes software not only for the printer but also for preparing files, a 3D curriculum, and mobile apps to design and print on the go. Ease of Use: Users can easily set up the printer in under 15 minutes with the Quick Start Guide and manual found on the MakerBot website or app, then load the filament and start the first print job. Videos and detailed, searchable, and user-friendly support materials for both the printer and software are also available on the website. MakerBot offers live chat, email, and various levels of phone support as well. Loading the MakerBot Print software is simple, as is creating a cloud-based account for storing and transferring files to the printer. With this software, users can import files they’ve created or import files from Thingiverse (MakerBot’s 3D design community) and then manipulate the layout of a print job to maximize use of the printer. Creative Use of Technology: The MakerBot Replicator Mini+ has many unique capabilities. With the onboard webcam, users can monitor prints using a wifi network and a computer or mobile device with wifi or 3G/4G capability. MakerBot offers true remote monitoring through MakerBot Print and MakerBot Mobile, which allow users not only to monitor, but also to start and stop print jobs from anywhere. The swappable magnetic Smart Extruder+ enables users to quickly and easily change print heads when there is a jam, eliminating downtime, and it also means users can change print heads as new materials are released without having to replace the entire printer. With the new MakerBot Print software, users can print directly from CAD formats and don’t need to convert to STL, saving time and frustration with conversion errors. 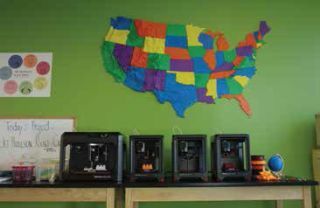 Suitability for Use in a School Environment: As part of its 3D ecosystem, MakerBot allows access to Thingiverse Education, which is filled with ideas for implementing 3D printing in the classroom—from the basics of 3D printing to curriculum-aligned lesson ideas. The PrintShop app for iPad makes it easy for teachers and students to get started experimenting with 3D design and printing. The SmartExtruder+ makes the Replicator Mini+ a good choice, because users won’t need to purchase a whole new printer when new print materials are released. The MakerBot PLA filament is similar in price to other filaments on the market. While the Replicator does produce noise, the Mini+ is much quieter than the Mini. The MakerBot Replicator Mini+ offers a variety of apps and software to make printing easy for novices, and it produces highquality prints. • Quality. The MakerBot Replicator Mini+ stands out for the quality and speed of its print jobs. • Ease of use. Features like the SmartExtruder+, auto calibration, and quality support materials make it easy to use the Replicator Mini+ in a K–12 environment. • Apps and software. MakerBot Print and Mobile apps allow users to begin experimenting with 3D printing right away—through creation of their own files in PrintShop or through experimenting with files downloaded from Thingiverse.